Been in Shangahi for a full week as of yesterday. We have a proper apartment and everything now! I haven’t blogged yet because…. I’ve been too busy eating. I mean strictly for blog research, obviously. Only for the blog. And also it’s COLD here so I figure I should build up a couple extra hibernation layers for warmth, right? Anyway you always hear about how hard it is to eat vegetarian in Shanghai. So far it’s true to a certain extent because in Chinese cuisine meat is often used as a flavoring even when it’s not a main ingredient of the dish, so you can’t necessarily just order a dish without actual meat chunks in it and expect it to be vegetarian. For example, on my first day I ordered a tofu dish and it came in pork broth with little pork bits in it. Sneaky. And, you know, since I’m not yet fluent in Mandarian 😐 it’s hard to communicate to find out what menu items contain. You don’t have the luxury of just pointing to a picture and seeing what arrives, like meat-eaters do. 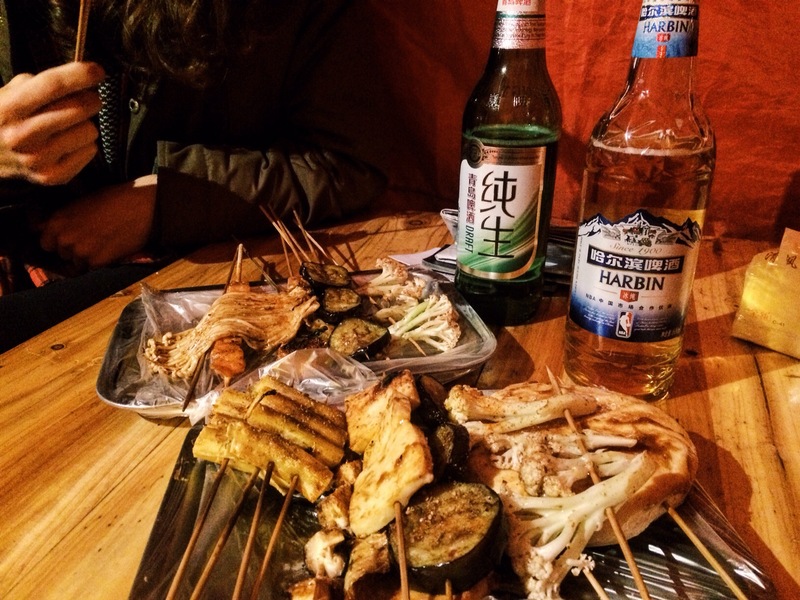 There are little stalls all over the place that sell small, super-carby, yummy snacks to take with you. I had almost given up on finding vegetarian dumplings when I stumbled across an old man selling dumplings stuffed with fried rice. Yeah, you read that right. Ryan asked in Chinese if there was meat in it (think he’s sick of asking that question for me yet?) and nope, just fried rice inside a dumpling. Mind blown. 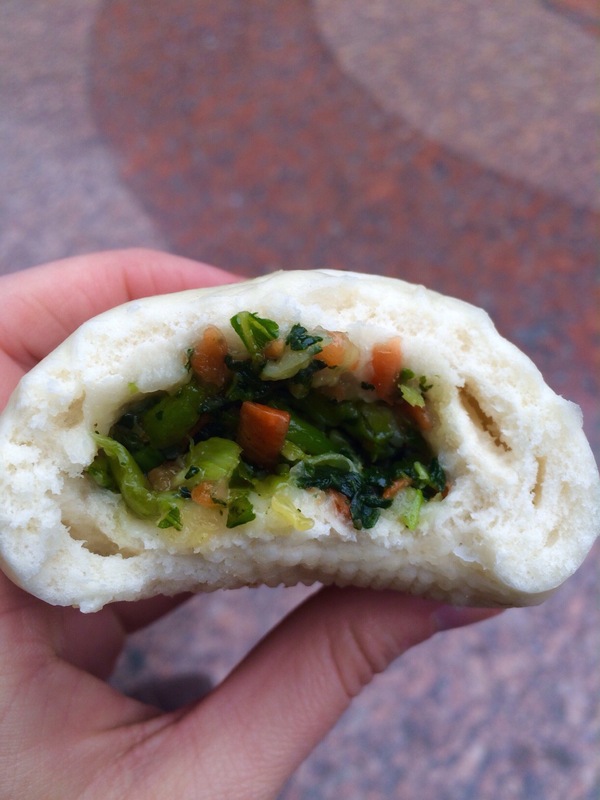 My favorite so far, though, are the steamed buns with vegetables inside. 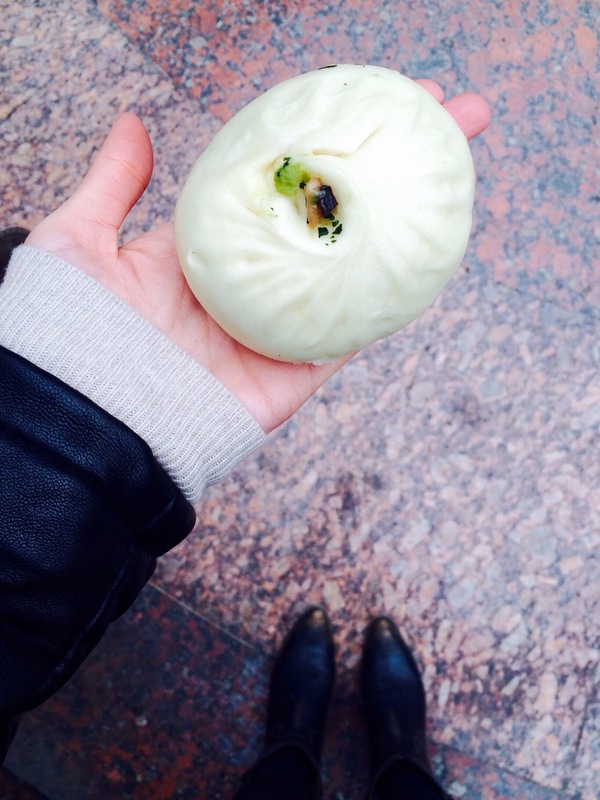 Think the inside of a spring roll, outside of a steamed squishy bread bun. This was a point-at-a-picture-and-hope-for-the-best occasion. It was delicious. You can also get these with bean paste or sesame seed paste inside, but I haven’t gotten to try one of those yet. I’m sure they’re great. 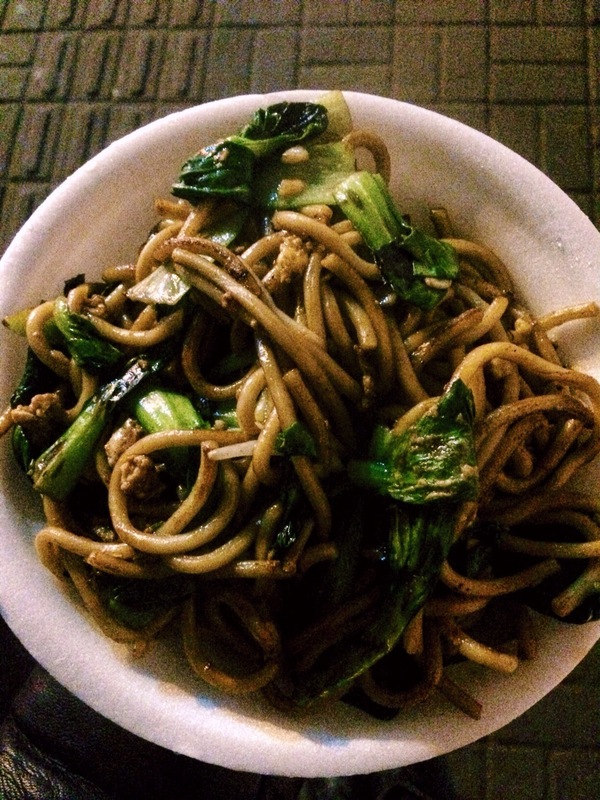 Fried rice/fried noodles: The food scene really comes to life in Shanghai at night. Red tents get put up all over the place with a man or woman with a wok or a grill inside making food, and little plastic tables and chairs are set up for people to eat at. It’s my favorite thing in this city so far. A lot of times it’ll be a person making either fried rice or noodles in a big wok. These are not the healthiest but really tasty and so cheap – for a portion of rice or noodles it will set you back about 7rmb – aka $1. And these are very easy to get vegetarian – the meat is usually something people get added on as an extra. I got noodles with bok choy and slurped those babies right up. They come in a styrofoam bowl and you eat them right there. The man there was asking us where we were from – if we were from “Obama.” He kept saying Obama! And I thought it was a Chinese word for something, didn’t even occur to me what he was saying. Oh dear. 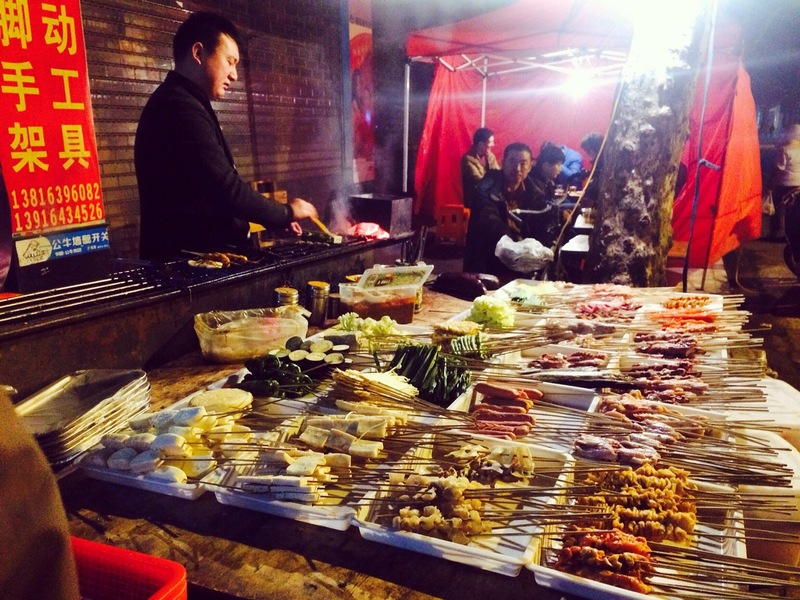 So there you go – street food in China. Unhealthy, cheap, so tasty. What a delight it is to read all about your escapades & a great insight to the culinary world of other countries.